From the publishers of the market leading at a Glance series, and in collaboration with the Association of Respiratory Nurses (ARNS), comes this easy-to-read, highly visual guide bringing together key principles of Respiratory Nursing. Highly visual, each topic is covered in a two-page spread, making it easy to quickly read up on key information and grasp the essentials of respiratory care, as well as a focus on preventative measures to prevent, minimise and control respiratory disease. Takes a unique, holistic approach to care across the life course – from childhood to end of life care. Provides need-to-know information in a highly visual, evidence-based, quick-reference format. 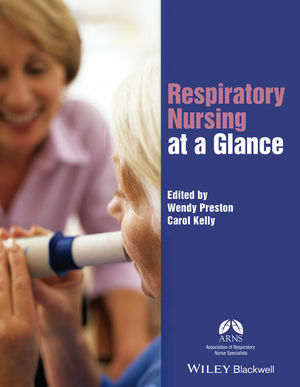 Respiratory Nursing at a Glance is ideal for nurses and health care students and practitioners at all levels involved in respiratory care. Wendy Preston is Nurse Consultant and Senior Lecturer in the Faculty of Health and Social Care at Coventry University, UK. Carol Kelly is Senior Lecturer and Programme Leader for the MCh (Masters in Surgery) programme at Edge Hill University, UK.